There are tons of great outdoor security cameras to choose from these days. It’s not hard to find one with dependable motion detection, clear night vision, and the ability to withstand a bit of inclement weather. But which one should you invest in? Our favorite is the Arlo Pro 2 because of its wireless design and accessible video history. But it’s not your only good option. 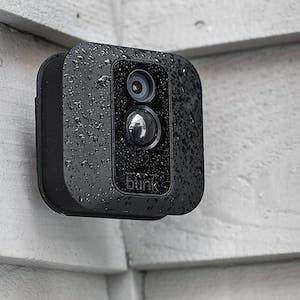 Check out our reviews of the best outdoor security cameras to find the one that’s best for your home whether you want to check on your kids when they get home from school, or scare off package thieves when the fruits of your last online shopping spree show up on your porch. If you’re serious about security, you’ll probably want at least two outdoor security cameras to cover your home’s entrances—especially if you have a side door or back yard. With that in mind, the table below lists the price for two cameras and the required base station. 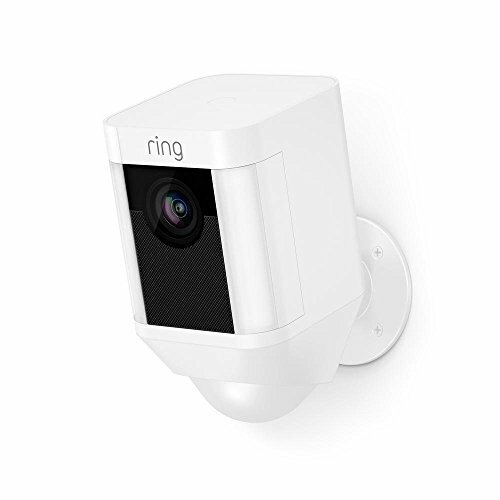 The Arlo Pro 2 and the Blink XT both also work well as indoor cameras, so if you don’t need an extra outdoor camera, you could always place the second camera inside. *Standard MSRP. Prices may vary depending on retailer. Note: We’ve included the standard list price, but you can often find these cameras at discounted prices. **IFTTT: IFTTT stands for ‘if this then that.’ IFTTT compatibility lets you program your device to perform specific actions in specific scenarios—for example, you could set it up to have your Philips Hue lights turn on if the Arlo detects motion. Size: 2.8 x 3.1 x 1.9 in. The Arlo Pro 2 beats out well-known competitors like the Nest Cam and Logitech Circle 2 because its wireless design makes it much easier to set up and move. And you get seven days of video history access—an eternity compared to Nest’s measly three hours or Logitech’s 24 hours. 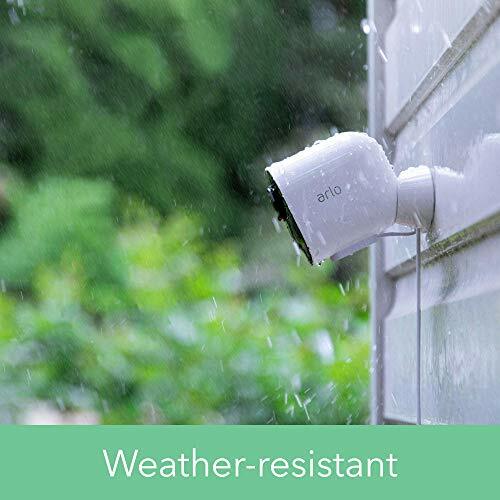 Aside from the easy setup and longer video history, Arlo Pro 2 cameras offer exactly what you’d expect from a quality outdoor security camera—motion detection, night vision, 1080p resolution, two-way audio, remote control through your mobile device, and a weatherproof design. 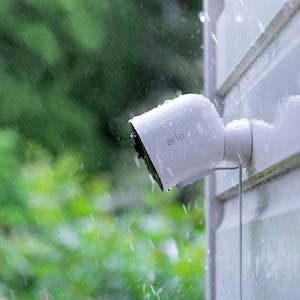 Like just about every other security camera brand, Arlo offers a paid monthly subscription service, Arlo Smart. 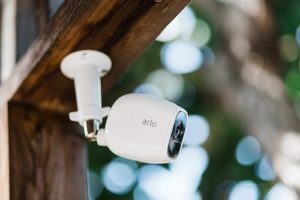 But unlike other brands, Arlo’s cameras are extremely useful without the monthly subscription—something that’s honestly rare in the security cam space. And if you do decide to spring for a monthly subscription, Arlo Smart offers more video history than Nest’s service—Nest Aware—at a lower price. As an added bonus, Arlo Pro 2 works beautifully as an indoor camera. When the camera is plugged in indoors, you still get motion detection, night vision, and more, but you get the added ability to continuously record footage. Size: 2.79 in. x 2.79in. x 1.34 in. The Blink XT isn’t as capable as the Arlo Pro 2. While pricer cameras have two-way audio, the Blink XT has one-way audio. You’ll be able to listen in remotely, but since there’s no built-in speaker, the person near the camera can’t speak back. It also has a narrower field of view than the other cameras we recommend. But at about half the price, it’s a great deal on a dependable little security camera. It’s also wireless so you can set it up almost anywhere. Plus, its black exterior and small size mean the Blink XT is a great option if you want a discreet security camera. As with most great deals, there is a downside—the Blink XT’s livestreaming interface interrupts you every 30 seconds to ask if you want to keep watching. The idea is that it helps preserve battery life, but it can certainly get frustrating. And while you get free cloud storage, there’s only 7,200 seconds of storage space (equivalent to about two hours of footage). Once it runs out, the oldest clips will automatically be deleted. But even with minor drawbacks, the Blink XT wins our recommendation over other inexpensive outdoor cameras like the YI security camera because it’s easier to install and has a more user-friendly app. 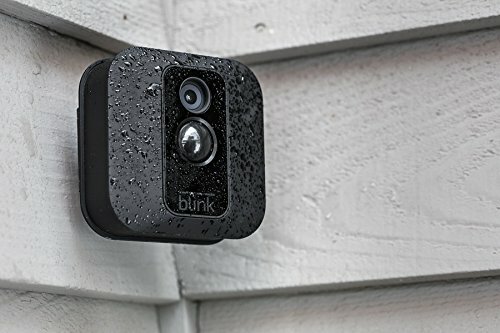 If you’d like a small, wireless, weatherproof security camera, the Blink XT is a solid, low-cost choice. 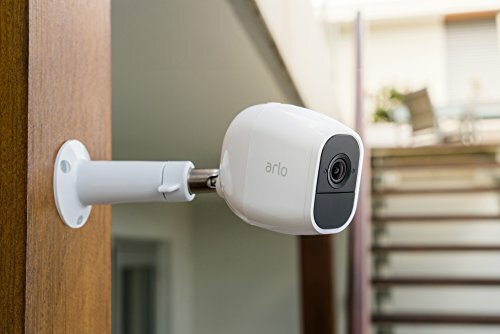 Note: The Arlo Ultra is scheduled to be released soon, but isn’t out yet. We kept it on the list because it’s one of the most impressive cameras out there—we think it’s worth a short wait. Want to be one of the first to get this high-end camera? It’s available for preorder right now. You probably don’t need everything you get with an Arlo Ultra camera—but damn, it’s cool. If you’ve got a bit of extra cash to spend, we think you’ll get what you pay for. With a superwide lens, 4K video, and HDR, the Ultra is more or less unrivaled in the consumer security camera space. This camera can simply show you more. But the visuals aren’t the only impressive thing about the Ultra; it’s also got two-way communication with noise cancelling to keep the sound clear, a motion-activated spotlight, and a siren that you can trigger to scare off unwanted visitors. Plus, it’s compatible with more third-party platforms than many other cameras. Arlo Ultra works with Google Home, Amazon Alexa, and Apple Watch. Custom activity zones: Get alerts when motion occurs in specific, hand-selected areas. Emergency call service: Gives you the option to send emergency responders straight to your home when you get a mobile notification. We’re excited about all the high-end tech and handy features offered by the Arlo Ultra. If your budget has some extra wiggle room, you’ll have one of the latest, greatest outdoor security cameras on the market. The outdoor security camera space is full of solid choices. And while the cameras below didn’t quite make the cut, they’re great alternatives if our top three picks don’t quite suit your needs. And unlike the cameras listed above, none of the following cameras require a hub to work. Just buy the camera and set it up where you’d like. 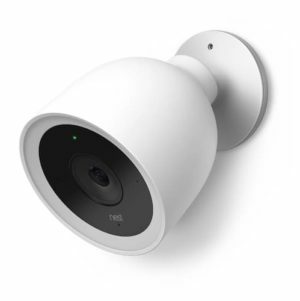 The original Nest Cam Outdoor didn’t make the cut because it offers so much less cloud storage than competitors and because, while easy to install, it’s not quite as easy to set up as a wireless camera. But if you don’t need a lot of storage and don’t mind wrangling a power cord and drilling some holes, it’s still an excellent little camera with an almost cute, modern design and a magnetic mount for faster installation. The Nest Cam IQ Outdoor is impressive. 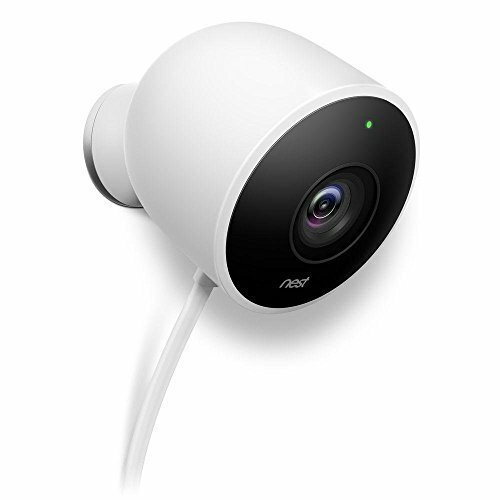 We almost chose it for our upgrade pick but ruled it out because, just like the original Nest Cam, its free video history options are extremely limited compared to Arlo. 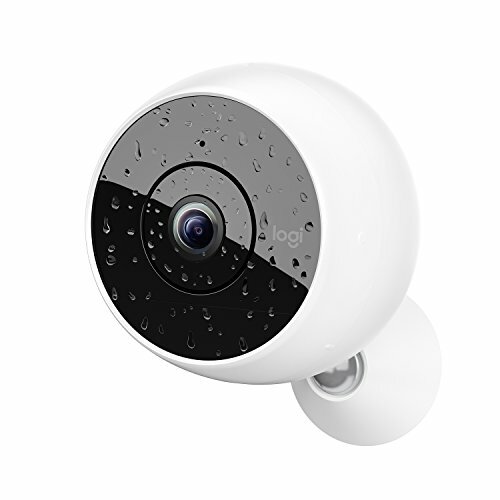 It also has clear two-way communication, reliable motion detection, and crisp, color night vision. That said, it does come with a handy spotlight for keeping your entrances lit in the dark. It also includes customizable motion sensors—if you notice the sensitivity is too high or low, you have the option to make adjustments. Logitech Circle 2 is a popular security camera with many reviewers, and some will disagree with our choice to leave it out of our top three. Ultimately, we left it out because Arlo has better customer reviews and much more free video history. But the Logitech 2 is still a great camera with a remarkably wide field of view—180° as opposed to the standard 130°. It’s priced affordably and comes in a wired or wireless version depending on your preferences. While it isn’t our favorite, it’s a serious contender. 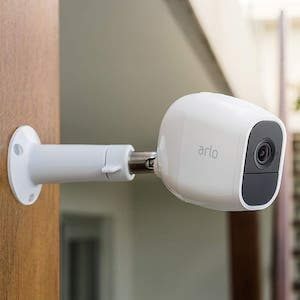 Any security camera listed in this post will do the basic job—but when you look at features, capability, and cost, the Arlo Pro 2 is likely the best option for most people. Need more security gear? Check out our post ranking the best security systems or our review of the best doorbell cameras.